Berlin’s Santé drops one of his most beguiling records to date on Defected complete with a remix from Souvenir Music favourite Rampa. Over the last few years, Berlin’s Santé has emerged as part of a wave of new producers and his productions ooze character, charisma, soul, colour, humour and a sense of humanity that feels so devoid from the less inspiring corners of house music. With high-profile supporters of the likes of Matt ‘Radio Slave’ Edwards and Tiefschwarz, Santé has made his mark on a variety of acclaimed electronic imprints, including Cocoon, Nick Curly’s 8bit and Steve Lawler’s VIVa Music. 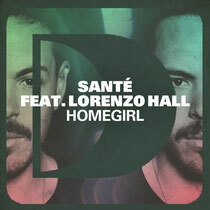 Featuring the vocals of Lorenzo Hall, ‘Homegirl’ is a modern-day love song with a sincere vocal and simple yet effective chord progression that flicks in and out of the solid bass throb upon which the record lays its foundations. Rampa’s remix builds itself around a heady, drum-based groove, firming up the beats and sharpening the snare for a more direct dancefloor interpretation. The vocal is further pitched down, giving the track a deep, earthy quality that contrasts well with the sun-kissed elegance of the original. It’s another big one for Defected and it’s out October 29.